Remarkable results after 60 days of twice daily use. A fresh fragrance to invigorate and energise. An easily absorbed formula applied with a specially-designed Effusion Contour Glove that boosts circulation, stimulates the lymphatic system and helps drain retained fluids. A light reflecting, tinted formula that makes all skin tones look smoother, more even and a whole lot more beautiful. A powerful, patented combination of ingredients, including a unique blend of marine actives, antioxidants and Green Coffee Berry penetrate deeply to produce industry-leading contouring that firms the legs, buttocks, abdomen and backs of arms. Our patent-protected technology includes two supercharged marine based active ingredients, ACTIGYM™ and BODYFIT™. These supercharged ingredients are perfectly complimented by stimulating Green Coffee Berry, Shea Butter and Coconut oil to provide moisture, smooth the skin and aid elasticity. BODYFIT™ contains glaucine molecules from the poppy flower to stimulate fat burning and inhibit the formation of new fat cells as well as optimising fluid drainage. ACTIGYM™ is rich in peptides and glucides, isolated from the Bermudan sea sponge, that mimic the effects of endurance training to improve body tone. ACTIGYM™ stimulates skin-supportive collagen and elastin and speeds up fat burning. You don’t have to take our word for how wonderfully effective Effusion Twice a Day Active Cellulite Cream really is. We have invested in third party scientific testing to prove our product’s results. A quick and easy to use gel formula – no mess – not even in the shower tray, simply smooth skin in minutes. Powerful formula that capitalises on natural ingredients, rather than chemicals. Microbead-free formula that respects the environment. A fresh minty scent that cools, invigorates and energises. A blend that has been scientifically proven to soothe and smooth skin. 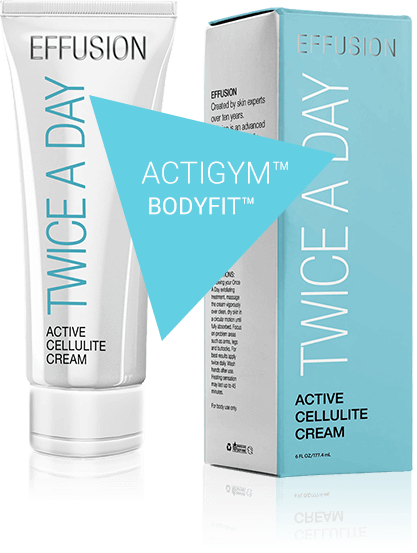 The ultimate partner for the all-powerful Effusion Twice a Day Active Cellulite Cream. Set to shake up the body scrub market through a patented power blend of cellulite-bashing botanicals, stimulating caffeine and soothing aloe, Effusion Once a Day Body Smoothing Scrub brilliantly buffs away dead skin and stimulates the microcirculation with Peppermint and Grapefruit extract to refresh and tone skin. The result? A body scrub that smells great and revitalises the senses. Your new daily ritual reinvigorates and leaves skin perfectly prepared for the powerful contouring, firming and cellulite diminishing effects of Effusion Twice a Day Active Cellulite Cream.